And now let's never speak of that last month again. After one of the worst Octobers in recent history at the box office, like sink-to-the-bottom-of-the-ocean bad, there are no chances being taken for the first weekend of November (but, wait for it...). Two properties that are each 50-years-plus old hit the screen, but one for the 26th time, and the other for the first time in over 30 years. Spectre represents the last appearance of Daniel Craig as James Bond in his grittier, thuggier, more emotionally conflicted version. Since replacing Pierce Brosnan after his unceremonious dumping in the wake of the critically disastrous Die Another Day, Craig's Bond has been present as the franchise lifted itself to new heights – even if it's simply wrapping itself in the cloak of modern spy thrillers. But hey, a 50-year-old franchise has to change somewhat if it wants to survive, right? Spectre is in a way a turn to older Bond, as the titular organization was last a thing in the movies in Diamonds Are Forever. A global terrorist group, it purports to be behind everything that's gone wrong in the last three films (oh, so they wrote the screenplay to Quantum of Solace? Bastards!) for Bond, specifically in the person of a man who they swear up and down isn't Blofield then run away giggling, played by Christoph Waltz. One wonders how far they take this bit (that time your eggs were a little overdone? That was *meeee*), but with MI6 still in disarray after the events of Skyfall, it's a natural outgrowth of the plot arc they've been working on to essentially break Bond. The movie features the usual exotic locales (and keeps to the tradition of every visit to Mexico City in the movies being on November 1st) and exotic femmes fatale, this time with Monica Bellucci and Lea Seydoux (most famous recently from Blue is the Warmest Color). One can't help but feel a bit of a letdown in the promotion of this film compared to the last one in most aspects, though. 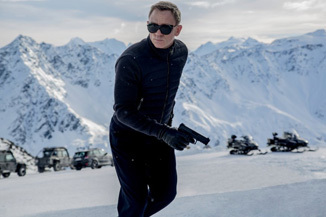 Perhaps it's the negative vibes given off from Craig, who is clearly just done with all this, or the lack of really spectacular set pieces (nothing comparing to the brilliant cuff adjust train jump), or even the theme song, which is a bit of a boring dirge compared to the at worst Top 3 effort of Skyfall. Sam Mendes still directs, but it also loses one of its key weapons as cinematographer Roger Deakins (give him an Oscar, already) exits, so it's not going to look quite as pretty as Skyfall did. It's a bunch of little things that add up to a lot.